5160 Spring Steel Celtic Leaf Blade Shortsword with Wood Core Leather Lined Scabbard. 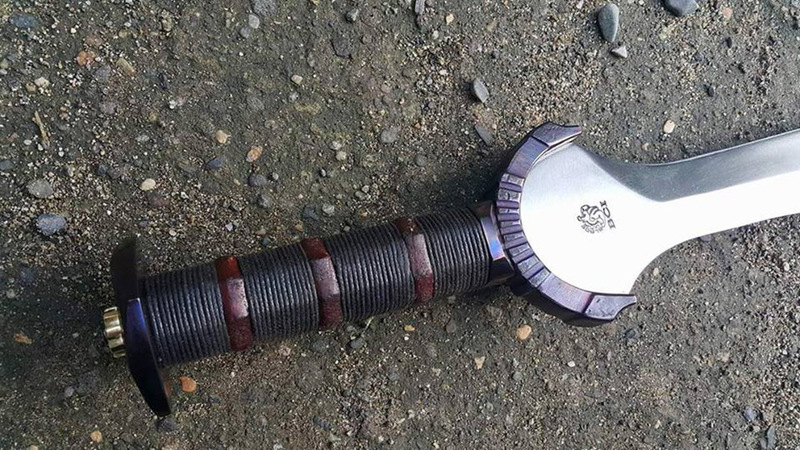 The Sword that inspired the SBG Fantasy Blade Project. 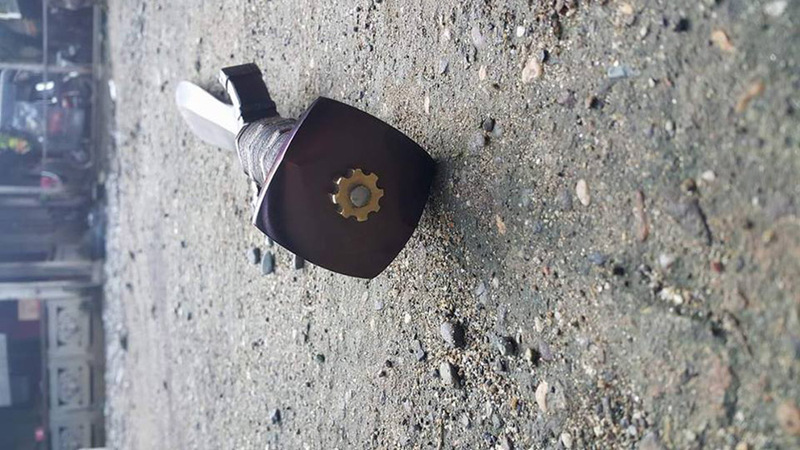 THIS is the sword that immediately drew my eye upon my visit to the Forge in Pangasinan, the Philippines. 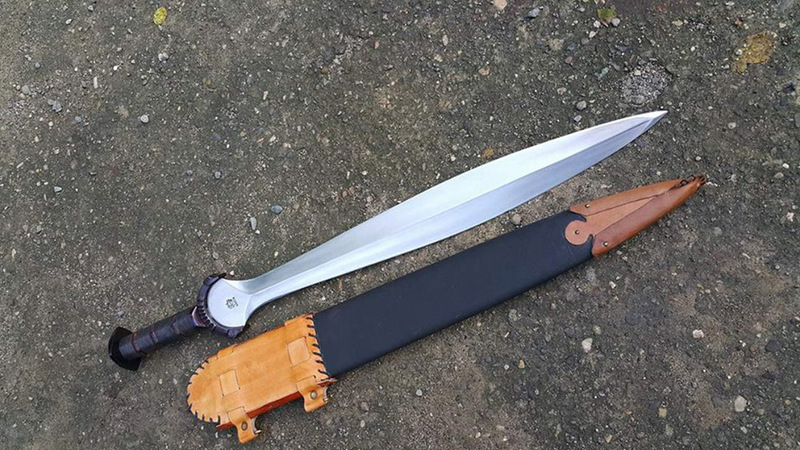 While it is a contemporary interpretation of an ancient Celtic Leaf Blade Sword design, personally I saw it as an extremely well done, fully functional fantasy blade - and it was this blade that inspired me to work with BCI to create a line of fully Functional Fantasy Swords. 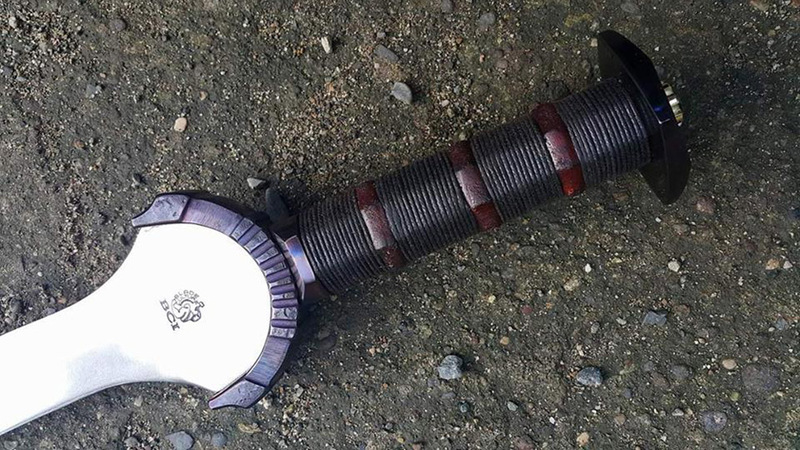 This sword is based on a historical La Tene design from around the 5th Century BC. These swords were made of iron instead of bronze, and is essentially the ancestor of ALL medieval European Swords. 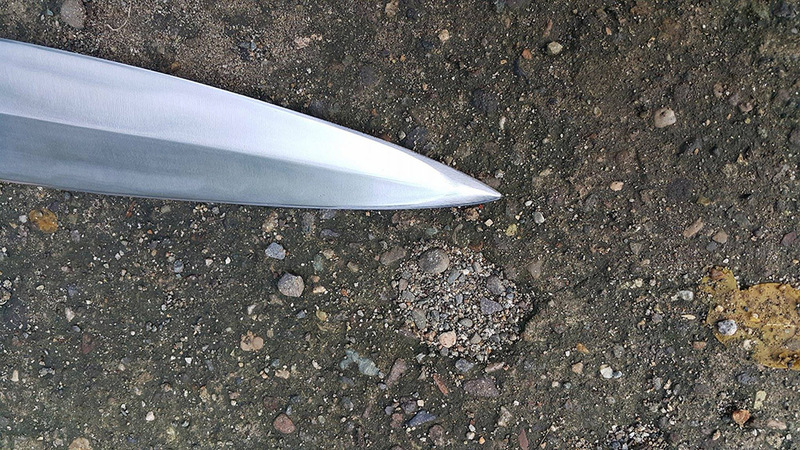 Leaf blade swords like this one have the greatest amount of mass right at widest point of the flared blade, giving it maximum impact when cutting, but also quite capable of a deeply penetrating thrust. The BCI recreation is completely hand forged from start to finish with countless hours of work going into each and every sword. 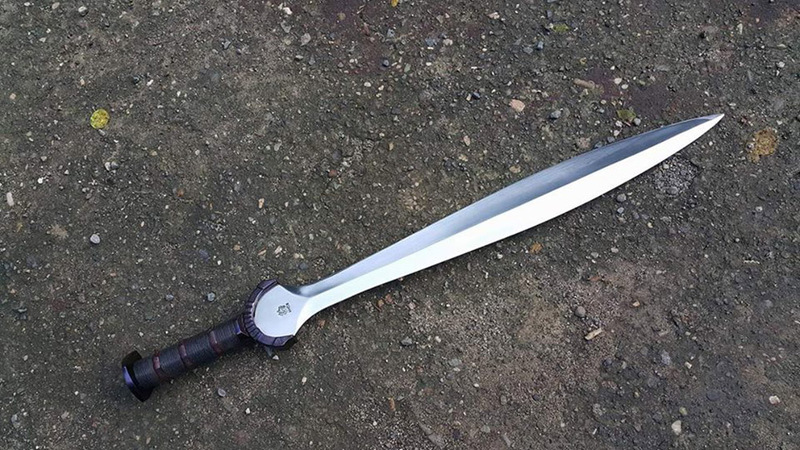 The blade itself is forged from monotempered 5160 Spring Steel, an extremely tough and hard wearing modern steel that would have cut the iron originals asunder and is many times more durable than the actual swords used in battle 2,500 years ago. As such, it makes a great backyard cutter and piece of functional sword art. 5160 Spring Steel Sharpened Blade. Aged Brass Fittings to copper appearance. Threaded pommel construction. Mahogany Wood core handle with leather wrap and wax cord bindings. Two toned leather bound over Mahogany Wood core scabbard. Premium Quality Construction. Took advantage of the sale on this sword, and couldn't be happier with it! Blade is absolutely georgeous, sharp, and well polished. Symmetry is almost perfect, and it's obvious someone with an appreciation for detail crafted it. Feels great in hand, and the fittings are well cast if not historically accurate. I'm not a big fan of ornate things you wouldn't even want to handle, so the subdued design and finish are a great fit for me. I like swinging it at things, but love it on the wall too. Don't see a peen on the pommel, so I'm assuming it is a screw on, which doesn't bother me at all on a modern interpretation. Only low point is the scabbard, which offers zero retention and seemed like an afterthought. It's nice enough to look at, but it's obvious that most of the work went into the sword. 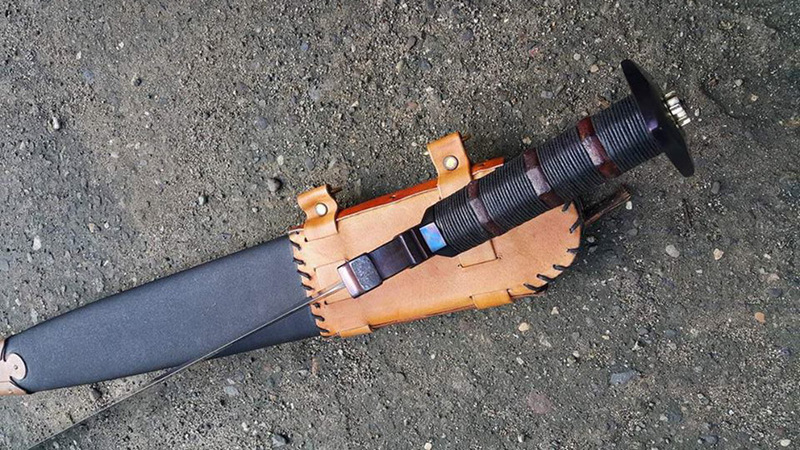 A commission on a custom scabbard is in someone's future. If you love this style of blade, you won't be disappointed with this purchase in the least. BCI is definitely going to see more business from me.